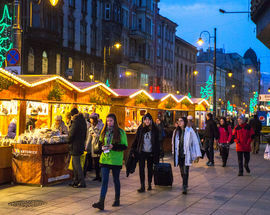 The Christmas Fair in Katowice is an event to remember as it takes place on the massive and recently renovated Market Square (Rynek). 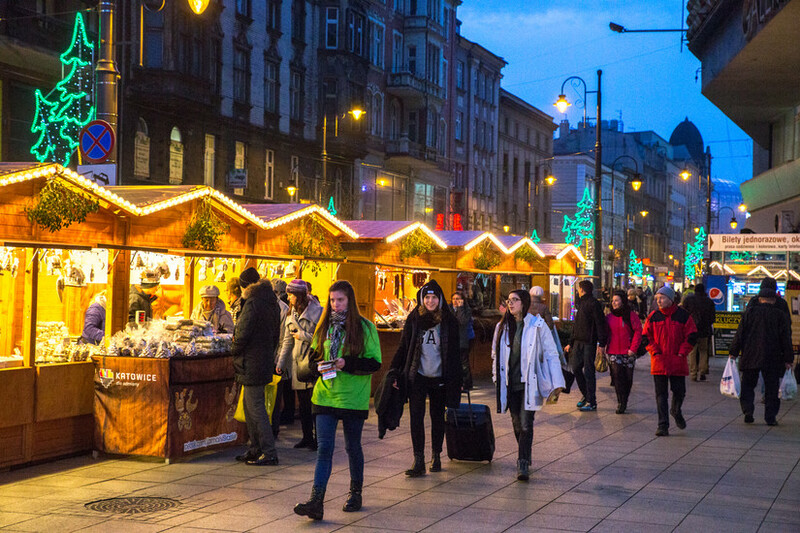 The tradition of Christmas fairs or markets in Poland is an ancient one, and the markets in cities like Krakow, Wrocław and even Warsaw have been drawing tourists from near and far for decades, if not centuries. Sure, most of these markets are totally commercial and more than a little kitschy (cue the slightly out of tune grannie choir). Yet they all possess an undeniable charm that even the most hardened Scrooges are inevitably drawn to. Perhaps it’s the rows and rows of wooden huts packed to the gills with folkwear, wooden utensils, folky porcelain or winter coats made from oversized animal pelts. Or it could be the cheap hot mulled wine, or the stalls of roasted nuts and overpriced grilled meats with hordes of holiday shoppers gathered round to keep warm. Or maybe it’s the picturesque ice skating rinks where young lovers skate hand in hand to pop renditions of Christmas carols. For short term tourists and out-of-towners alike the draw is most certainly all of the above; oh yeah - that and the whole one-stop-Christmas-shopping thing. Make sure to also keep an eye out for local bands and choirs (yes, especially those grannies) performing on one of several outdoor stages throughout the month. Above all make sure to stay warm! There would of course be no Christmas Fairs without Christmas, and not only is it a big deal in Poland but it legitimately stretches on for a month and is rich with all kinds of traditions. The holiday season officially kicks off on December 6th, which is known as Dzień Świętego Mikołaja to some and the feast day of St. Nicholas to the rest. Tradition demands that children clean and polish their shoes the evening of the 5th and leave them by the front door. If they have been good during the year they will wake to find that St. Nicholas has filled those shiny shoes with treats. While St. Nicholas Day is the opener, the main act begins on December 24th, known locally as Wigilia. If you’re lucky enough to get an invite, make sure to jump at the chance. The focal point of the celebration is the evening meal, but before that can begin, everyone shares the Christmas wafer (opłatek); during this extremely intimate holiday ritual, everyone in attendance meets face-to-face in pairs, breaking off a piece of the other person's wafer and giving them a personalised blessing. It’s a tradition cherished by many Poles and one that intrusive foreigners should not use as an opportunity to joke around. So, what to expect once the dinner trolley gets wheeled out? Well, bad news if you don’t like Polish cooking, basically. Supper consists of a whopping 12 courses - one for each apostle - with the food reflecting various agricultural elements (fields, forests, water) so that each will bear fruit in the forthcoming year. It’s for this reason you’re expected to try a bit of everything, whether or not you’d prefer to hide it under the table or in your napkin. Furthermore, the more you eat the more prosperous you will be. The dinner is meant to be meatless, and though the church recently lifted this age-old ban, the majority of Polish families still maintain the meatless tradition. Don’t expect a turkey to be making its way onto the table; the main course is usually carp, and this traditionally comes served 'the Polish way’ - in a grey sauce with almonds and raisins (which is every bit as appetizing as it sounds), or sometimes breaded and fried. If you’re staying with a Polish family the night before, don’t be surprised to find the fish kept swimming in the bathtub in the run-up to Wigilia. If all this sounds a little awkward, don’t panic. With the carp out of the way you’re on easy street, with the rest of the dishes including the whole galaxy of Polish potato inventions. 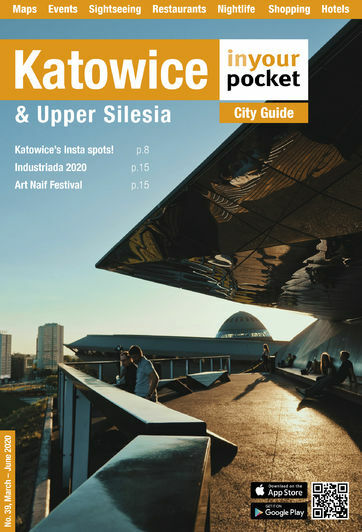 On top of that you’ll be looking at lapping up bowls of barszcz, meatless gołąbki, herring, pickles and poppy seed cake. Symbolism and tradition play a big part in the whole shebang, so don’t be surprised to find hay under the table (to remind everyone of Christ’s manger), and an empty seat set at the table in case a stranger comes knocking. Consider arriving with some glue on your fingers, as a spoon hitting the floor is taken as a sure sign it’s your last year alive. Alternatively, if you throw poppy seed cake at the ceiling and it sticks, then you’ll be expecting wedding bells sometime soon. Technically speaking the consumption of alcohol on Christmas Eve is a no-no, though Poles many turn a blind eye to this Catholic edict. When the first star has appeared in the sky, an angel covertly put presents under the Christmas tree and they are exchanged once the meal has finished. Later you'll find most Poles wrapping up like penguins to make it in time for midnight mass (pasterka). It’s at this hour, so they say, you’ll find animals taking on human voices. However you end up spending the holidays in Poland, we wish you a Merry Christmas and a Happy New Year from all of us at Poland In Your Pocket!